During the 2011-12 school year, the Blue Valley School District developed an innovation technology project to create technology-rich classrooms where teachers would integrate technology into classroom instruction. The project – Innovation Spaces - was designed to provide students with instructional activities to increase engagement, application and personalize their learning. Due to the size of the district and funding limitations, district administrators determined that a 1:1 initiative would not be feasible. After significant research and product evaluations, the decision was made to move forward with a shared iPad cart model. Teachers involved in the Innovation Spaces project will be required to share a mobile cart of 30, 32GB, Wi-Fi iPads. Educational Technology team members were charged with researching, evaluating and learning which apps would support classroom integration. The Ed Tech Team, consisting of six staff members, spent approximately six months researching educational apps that would align with the district’s curriculum and support project initiatives. Throughout the evaluation process, the team relied on a rubric to determine which apps would be installed on the iPads. Approximately 50 educational apps were selected for the student devices. 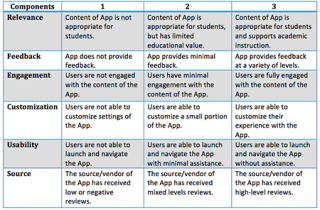 The rubric used to evaluate the individual apps is included below. In addition to evaluating apps, Educational Technology team members created tutorials, handouts and instructional videos to support classroom teachers in the integration of student devices, apps and features of the iPads. The support materials and resources can be found at http://www.bluevalleyk12.org/edhelp/ipad. Buildings were selected based on classroom observations, walk-through data and interviews with building administrators. Additional criteria used during the initial building selection process included the amount of technology available in the learning spaces, technology experience and attitude of the instructors, and the support and expectations of the building administrator. Each of the elementary buildings selected to participate in the project identified six teachers (one per grade level, K-5) to be involved in the Innovation Spaces project. A total of 30 elementary teachers were involved in the initial phase of the project. Each teacher included in the project received a personal iPad, each of the apps available to students, and cases. Teachers also received approximately 20 hours of hands-on professional development on classroom management, technology integration and appropriate applications and features of the iPad apps. Each of the five elementary buildings received two iPad carts with a total of 60 iPads intended for student use. The carts were set up using a variety of management programs. Devices intended for students were imaged to reflect common apps, wallpaper and folders. Apps were categorized into content-specific folders including productivity, math, social studies, science, etc. Student devices were placed into cases that had magnetic covers and provided protection for the iPads. Each of the elementary buildings elected to share the student devices in a variety of methods. In a few buildings, the student devices were divided equally between the six classroom teachers. Each teacher was given the student devices and cables to store and charge as needed. When a classroom required more than the allotted number of devices, they coordinated with other classrooms and collected the desired number for the project. Other buildings elected to use a sign-up method for the complete cart of 30 devices. The mobile carts were updated twice throughout the school year to apply updates to the devices. One staff member, in each of the participating buildings, coordinated the collection and distribution of the devices for the syncing and updating process. The first phase of the project, implemented in the Fall 2012, consisted of 30 elementary classrooms in five different buildings. Each elementary building has six classrooms (K-5) involved in the project. Across the five participating buildings, there were approximately 695 elementary students enrolled in an innovation spaces classroom. In December 2012, parents of students involved in the Innovation Spaces classrooms were asked about their experiences. Parents reported that students communicated with them about the exciting lessons and activities using the technology including the iPads, netbooks and document cameras. The majority of parents agreed that the Innovation Spaces project had an impact on their child's education and reported that their child used school-related technology at least one to four times weekly. The second phase of the project, scheduled for the Fall 2013 semester, will include an additional 60 elementary classrooms, 13 high school science classrooms and six library media centers. Based on the building level and student enrollment, each of the classrooms included in the expansion project will receive iPad carts. Teachers will continue to use the shared cart model. Through the expansion projects, the district hopes to identify how technologies, including iPads and apps, can support technology integration and encourage student engagement. It is the goal of the district to have Innovation Spaces classrooms, in some form, in each classroom across the district. As the district continues to expand the Innovation Spaces project, we will continue to evaluate the technologies, apps and web-based resources. We will continue to seek feedback and input from the students, their parents, teachers and building administrators. Teachers and building administrators involved in the project approached the technologies and project expectations with little reservations. The success of this project is due to the teachers. Their input, time and energy can be seen in each of the students involved in the project. For a more detailed review of the project please visit http://www.bluevalleyk12.org/innovationspaces. Kristy Sailors is the Director of Educational Technology at Blue Valley School District in Overland Park, Kansas.